Why choose our test automation services? Eminence test automation services adopt very high standards for creating framework and script development.Based on the type of application, Eminence brings together best practices of different automation frameworks.Our technically QA team comprises of highly skilled and experienced automation test engineers, who know “when to automate?”, “what to automate?” and “how to automate?”. Our QA team believes in the test automation strategy to follow step-by-step procedure towards the achievement of goals and objectives. What makes us, stand apart and at the top of the leading test automation companies. End -End comprehensive solutions for Web, Windows, Web Services and Mobile automation. Our test engineers are highly enriched with manual testing and automation testing.They are capable of choosing the right automation scenario to do the automation. We are ready to create a new framework or tweak the existing framework based on the application functionality. 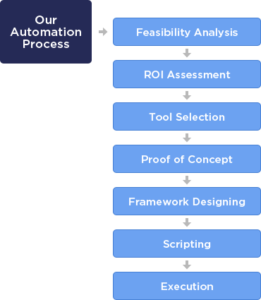 We not only write the scripts and deliver, we educate the people to write an automation script. We are well versed with the following tools and we are ready to adopt any new tools in the market. Why Choose TETS for QA Automation?